We are an established and renowned wholesaler, supplier, distributor and trader of wide range of Ceiling Tiles and Fittings. These are sourced from reliable vendors of the market. We are an established and renowned wholesaler, supplier, distributor and trader of wide range of Ceiling Tiles and Fittings. 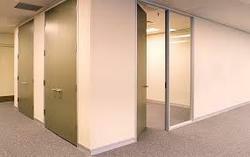 Our offered products are Office Partition, Wall Partition and Plasterboard Partition etc. These are sourced from reliable vendors of the market.